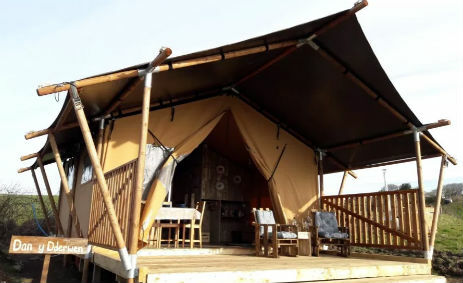 Get away from it all in South Wales with a glamping holiday at Under The Oak and unwind in our cosy and luxurious safari tent with hot tub. Dan y Dderwen lodge is nestled underneath an ancient oak tree next to a pond in a tranquil corner of our traditional family farm. 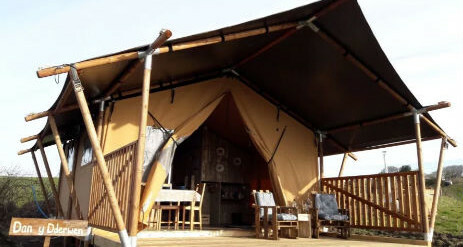 For an unforgettable experience, get back to nature, without giving up your creature comforts! 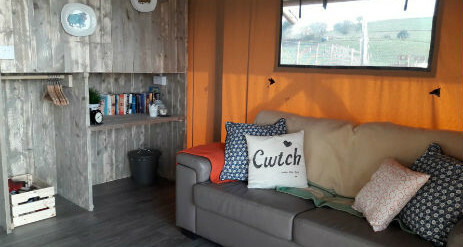 Our new spacious lodge features a natural wooden hot tub, wood burner, fully equipped kitchen and bathroom with a hot shower and fire pit for cooking outdoors. Cosy and comfy beds are made up ready for your arrival so you can unpack and relax. 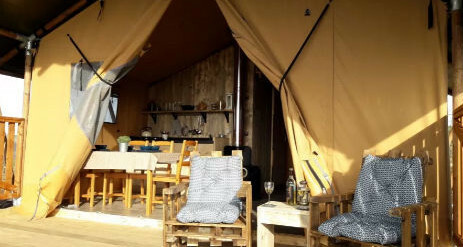 Outside the lodge you will find…. 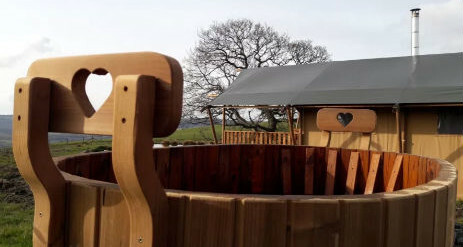 ‘The Love Tub’ is heated by a wood burning stove and once up to temperature will stay hot for around an hour, by which time you will be very wrinkly. 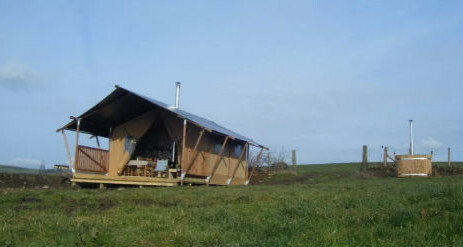 There are no nasty chemicals, just natural spring water which is of course changed for every guest. You can buy provisions from the local village which is only a mile down the lane but we have a small larder and honesty box next to the wood store where you can pick up some essentials. Our own free range farm eggs, local preserves, honey, pickles and chutneys. We also offer Arrival Hampers with basics, Breakfast Hampers and BBQ Hampers. Please enquire. Parents visiting with younger children please be aware that the lodge is very close to the pond, which is not fenced. One well behaved dog per lodge is welcome. For £25 per stay we will provide a bowl and basket for your four legged family member. We only ask that you keep pets out of the human beds and be mindful that this is a working farm so there may be sheep or cattle nearby. 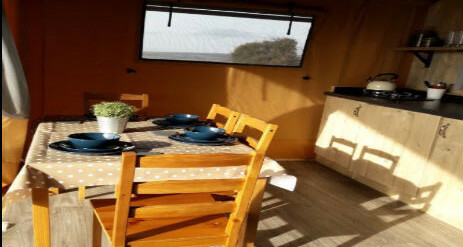 The lodge is situated in an idyllic traffic free spot which is about a five minute walk from the parking area, next to the farm buildings. We provide wheelbarrows to transport your stuff but please let us know if you need a hand.